Seagate introduced the industry's highest-capacity, 4-bay and 2-bay, desktop network attached storage solutions to help data-intensive small business address evolving storage needs. 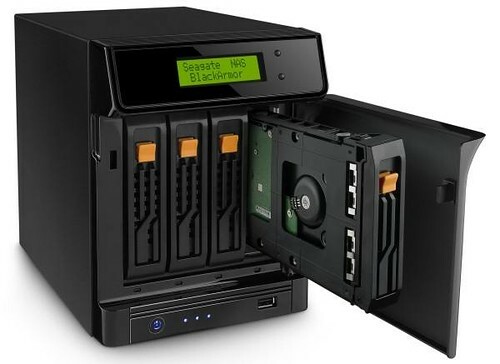 The BlackArmor NAS 440 network storage server and BlackArmor NAS 220 network storage server, extend the capacity range of Seagate's BlackArmor family of storage solutions, enabling businesses to now scale from 1TB to 12TB to help keep pace with the growing stores of high-definition multi-media files and business critical data. Initially, both solutions will come pre-populated with 3TB drives in each bay¹ and will be offered exclusively for 30-days through Seagate.com and select online retailers. For the first 30 days, CDW will provide the 12TB BlackArmor NAS 440 for a manufacturer's suggested retail price (MSRP) of $1,899.99, and NewEgg will sell the BlackArmor NAS 220 6TB for a manufacturer's suggested retail price (MSRP) of $649.99. Full-system backup and recovery helps protect everything on your PC's hard drive including the operating system, programs and settings. In the event of a system crash or failure, your computer can be restored to a previous point in time with SafetyDrill+ software.